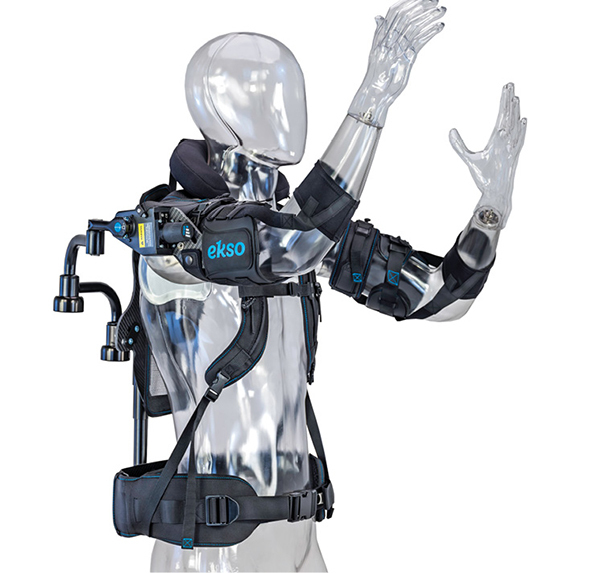 An upper-body exoskeleton that elevates and supports a worker’s arms to assist them with chest-height and overhead tasks, the EksoVest is made of lightweight materials, including carbon fiber mesh and a metal-tube frame. Image courtesy of Ekso Bionics. Wearable devices bestow incredible abilities, enable warehouse workers to lift great weights, gain extraordinary endurance and allow the disabled to recover some of their lost capabilities. These devices, called exoskeletons (exos) work with the user, augmenting, reinforcing and restoring human performance. Exos can consist of rigid materials, like steel, and soft parts such as elastic fabric. These devices can be active—powered by actuators and batteries—or passive, they can be mobile or stationary, and cover the entire body or just a single body segment. The relationship between exos and the human body—with all of the operating variables and the need for seamless interplay—poses great challenges for design engineers. Additional complexities compound these difficulties, forcing development teams to face issues like usability, affordability and design flexibility. These challenges are, to an extent, simply reflections of the technology’s evolution. Exos represent different things to different users and industries, and the technology’s complexity precludes a single clear definition. The fact is that exokeleton technology is continuously evolving and reinventing itself. Once considered just a novelty, exoskeletons have started to demonstrate their practical value. According to the ABI Research report, “Robotic Exoskeletons: Classes, Markets, and Applications (bit.ly/2qL2ypx), as of 2018, global exo shipments will be at 7,000 units. The research firm, however, expects total shipments to exceed 91,000 by 2023 and reach 301,000 by 2028. Many factors are promoting increased exo adoption. For example, startups have significantly enhanced these systems by improving drives, materials and power sub-systems. New battery technology now promises to power exo-suits for as long as eight hours. Furthermore, overall market conditions are improving. Changes in government policies have created an increasingly friendly regulatory environment. Equally important, the aging workforce and systemic skills shortage in developed countries has put pressure on companies to invest more in their employees, with exos becoming a force-multiplier to improve productivity. Market analysts predict that exoskeleton systems adoption could save companies billions of dollars by reducing hours lost due to physical injury. A bellwether of the improved atmosphere can be seen in the accelerating rate of deployments of the technology among large Tier 1 companies and original equipment manufacturers (OEMs), such as Ford Motor Co., which recently rolled out an exoskeleton program for employees in 15 plants and seven countries around the world. Why Not Just Use Robots? As appealing as these benefits are, in this age of growing automation why deploy exos when you can use robots? The answer is that the industrial sector isn’t ready to take humans out of its operations. Although exos enable humans to more efficiently perform physical tasks in industrial environments, humans provide an ingredient that current machine technology cannot match: agile intelligence. Industrial processes are often just too complex to automate with current systems. This is where exo technology comes into play. Exos can act as a bridge between the extremes of fully manual, nontechnology-enabled tasks and those processes that demand traditional industrial robots. The exo-human hybrid provides a solution that leverages the intelligence of human operators and the strength, precision and endurance of machines. The development of an exoskeleton differs from the creation of more established products because of the number of undefined elements engineers need to contend with and combine. “The specification and concept steps are as important for exoskeletons as they often are for any technology/product that is very new and thus has a wide open and unknown design space,” says Adam Zoss, staff scientist for Ekso Bionics, the company Ford partnered with on its exoskeleton program. 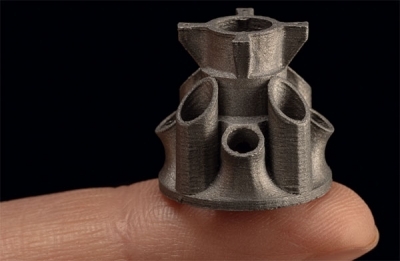 In developing exos, designers must juggle a variety of what seem like conflicting features. The absence of guidelines and benchmarks makes weighing concepts and specification trade-offs all the more challenging. 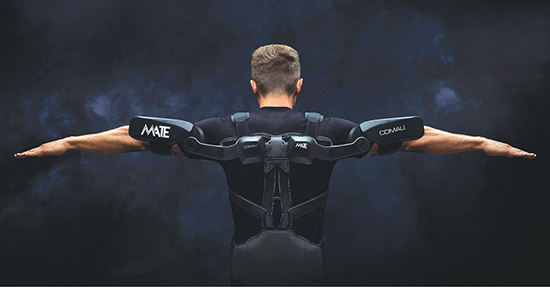 Ergonomically designed, Comau’s spring-based MATE exoskeleton offers a design that promises to accommodate different body shapes and sizes, with shoulder size, trunk height and waist-belt adjustment systems. Image courtesy of Comau. Although the exo design space seems a jumble of variables, with each product and application demanding its own unique set of requirements, some parameters have almost universal applicability. For example, a major challenge that almost always arises during the exo design process is the need to keep the frame as small and lightweight as possible while still maintaining adequate strength and durability. Because exoskeletons are wearable devices, the smaller and lighter the device, the more comfortable and practical they become. A commercial bionic walking-assistance system, the ReWalk exoskeleton uses powered leg attachments to enable individuals with spinal cord injuries to stand upright, walk and climb stairs. Invented by someone who was paralyzed in an ATV accident, this exoskeleton aims to be more than a rehabilitation system. It promises to provide users with mobility and independence in everyday life, worn all day, whether at work, out in the community or at home. Image courtesy of ReWalk Robotics. The ReWalk exoskeleton operates its six moving joints in a manner that mimics the natural human gait. The system moves both ankles with a spring mechanism that drives a footplate, which bears all of the system’s weight. Mechanical motors and gears along the side of each leg move the knees and hips. The system supports walking speeds about two-thirds that of most individuals’ walking patterns. The user controls the system via a wrist-mounted remote that detects and enhances the user’s movements. Control and power components—including sensors, software, hardware and batteries—are worn around the waist, managing sit-to-stand functions, walking speeds, movement up and down stairs and sit-from-standing functions. The developers have taken the ReWalk exoskeleton one step further, expanding the technology’s application in the form of a system called ReStore. This exoskeleton targets those who have had a stroke, or suffer from multiple sclerosis or Parkinson’s disease. ReStore promises to provide the ability to make real-time adjustments of the forces needed for walking. ReStore is currently in late-stage clinical trials. In a related issue, designers must weigh component strength vs. system performance. 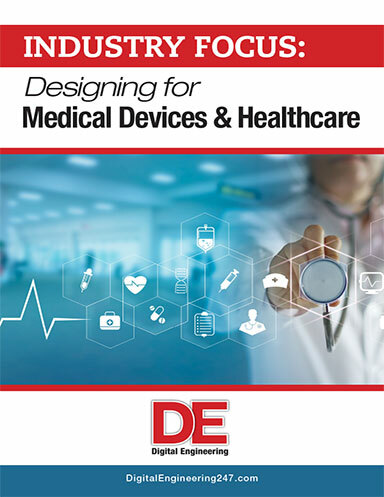 Here, the designer must determine the optimum strength of actuation and sensing hardware given cost and reliability constraints. Another major challenge arises from the designer’s need to meet the demands of potentially mutually exclusive goals. On the one hand, the exo must tightly integrate with the wearer. On the other, the design must have the flexibility to accommodate as broad a spectrum of users as possible. For practical purposes, exoskeletons are often designed as one device fits all (or most) through adjustments. The goal is to design the device so that it has the modularity to make “it easy and simple to select the proper size and support level for different users,” says Joseph Zawaideh, cofounder and vice president of marketing and business development at Levitate Technologies, which has released a wearable exoskeleton called AIRFRAME. This is easier said than done, partly because of the shortcomings in tools available to the designer. “Human factor data and tools or human models can help with this aspect, but they fall very short of reaching the level of detail necessary to help with all the challenges associated with designing a wearable device,” says Zoss. As with the development of more conventional devices, modeling and simulation play important roles in the design of exos. Development teams use solid modeling CAD and CAE programs to develop engineering drawings, while leveraging ECAD/EDA software to create electronics subsystems. 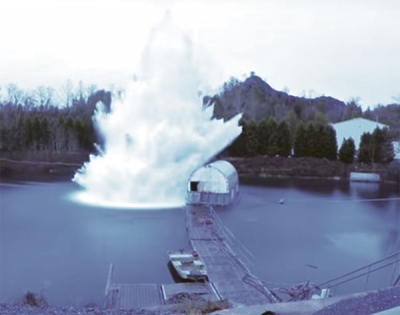 Later in the design process, designers use various simulation tools to evaluate design functionality, structural strength and dynamic properties. For example, designers extensively use finite element analysis (FEA) software to evaluate the mechanical strength of exo components and to balance the size, weight and strength of the various subsystems. 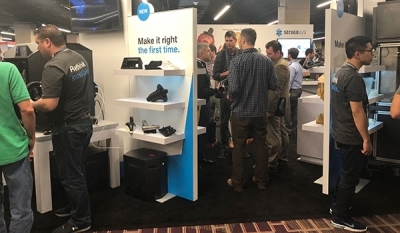 “[FEA] gave us important insights and a boost in performance of the device,” says Andrea Ivaldi, product marketing manager at Comau, a subsidiary of Fiat Chrysler Automotive that focuses on industrial automation and has introduced the MATE, Comau Exoskeleton. Design teams also use mathematical modeling to optimize the mechanical performance and kinetic simulation to evaluate the dynamic properties of the exo’s moving parts. That said, shortcomings in modeling tool functionality hinder handling features unique to exo design, where the challenge is to tightly integrate the exo with the person wearing it. For example, CAD models of people generally scale in the major dimensions, such as height, width and leg length, but they fall short in representing smaller aspects, such as calf size. Furthermore, these models fail to represent major body shape differences. Creating designs that properly fit every person’s body shape, aligns with their joints and attaches in a comfortable manner becomes problematic. To compensate for these limitations, many development teams turn to extensive test campaigns, using end users. This approach relies on an iterative process that goes through several prototyping and testing phases. In response to the limitations of traditional design tools, software providers now offer a number of 3D CAD software packages suited to ergonomic simulation. 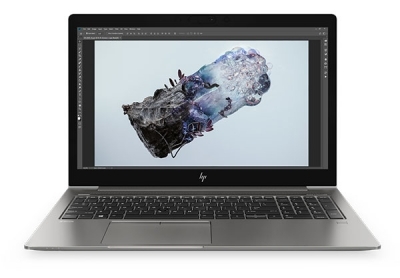 These digital human modeling (DHM) software tools enable models of humans to interact with virtual products and workplaces in a CAD environment. Today, the market offers a number of software packages suited to ergonomic simulation. For example, Siemens NX Human—based on Tecnomatix Jack technology—allows rapid evaluation of fit, clearance and reach issues without leaving the design environment. Another example of DHM software is the AnyBody Modeling System, which allows designers to create detailed musculoskeletal models and run computer simulations that integrate the human body into the product design. Dassault Systèmes also includes DHM tools in its Delmia Ergonomics Specialist product. In this platform, designers can place mannequins into a 3D model to evaluate human interactions with a product or workplace. Despite the design challenges, exos are gaining momentum on the shop floor and in other industries. 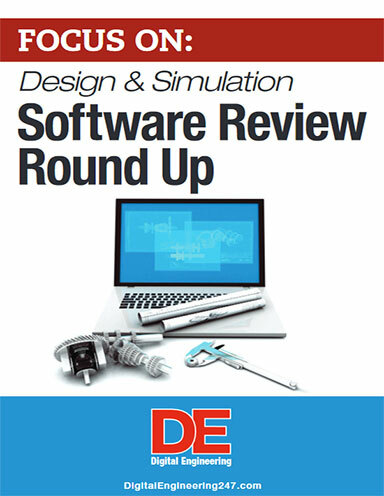 Software vendors have infused design tools with features that promise to help engineers come to grips with emerging ergonomic issues. Developers have boosted modeling and simulation capabilities, enabling designers to develop exoskeletons that begin to meet the price vs. performance sweet spot required to open the door for broader adoption. Looking beyond the short-term prospects of the technology, how will the proliferation of these devices impact the design of other industrial machines and automation systems? It may be too soon to tell. Exos are only just starting their evolution. Based on the current state of the technology, exos impact the human element on the shop floor more than machinery and systems.